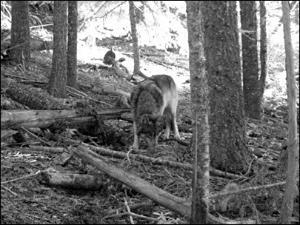 Early October, I left northeast Oregon on the heels of Oregon 7, a two-year old gray wolf from the Imnaha pack, the first pack in my state since the 1940’s. We were both headed southwest, him for whatever reasons inspire a wolf to travel, me returning home after a week-long writer’s retreat along the Imnaha River, where I’d been writing, hiking in the remote area, and tempering my reactions in a distinctly anti-wolf environment. I grew up with wolves at the zoo my father directed in Iowa. As with all our animals, wolves were treated with respect and with the expectation that they were likely to behave in ways that do not comply with human needs or desires. I learned that wolves are intelligent creatures, full of surprises, each one an individual. Once, I hauled a large wolf off the prone form of my husky, older brother. The wolf had taken a dislike to him (there was perhaps reason for this) and had decided to teach him a lesson. Another time, a wolf got loose and ran up behind me while I rode my horse on the premises. I dismounted, wrapped my belt around the wolf’s neck, and walked to the barn, horse on one side, wolf on the other, both eying each other but calm. We don’t always know what to expect from wolves. Perhaps this is one of the reasons they’re such an enigma, loved or hated, with not much in between. Shortly before the writing retreat, I wrote an article for The Oregonian on eco-tourism revolving around wolves in northeast Oregon. The usual range of comments followed the online article. Some applauded the idea, saying they would travel far for a chance to be near wolves. A local rancher said to hell with eco-tourism, and to hell with the outsider who wrote the article, the Imnaha pack should be eliminated. Traveling back to the corner of the state for the retreat, I was grateful that I would be holed up in a remote lodge away from the citizens of Wallowa County. But to my surprise, upon arriving at the huge log home that would house me and three other women, I learned that our writerly “den-mom” was a local rancher, one I knew to be a vocal opponent of wolves. If you don’t see the problem here, consider Amy Goodman spending a week in the same house as Sarah Palin. The retreat took on a whole new meaning, it became a place which forced me to deal with the tensions that rise and threaten to erupt while in the close proximity of someone who dislikes wolves as much as I respect them. This entry was posted in Oregon 7, Wolves in Oregon, Writing retreat and tagged grey wolf, Imnaha Writers Retreat, Iowa, zoo. Bookmark the permalink.